JOE Marston, the grand old man of Australian football and the first genuine legend of the game Down Under, has died at the age of 89. He passed on away on November 29 of natural causes, having been in frail health for some time. Marston was the first Australian to take part in an English FA Cup final, turning out for Preston North End in the 1954 Wembley decider against West Brom, who were 3-2 winners. His team-mates that day included the legendary England winger Tom Finney and Scottish international Tommy Docherty. A solid defender, he made 154 appearances for Preston and was also picked to represent the English League in a game against the Scottish League. His room-mate in a Glasgow hotel before the game was Manchester United's brilliant midfielder Duncan Edwards, who died in the Munich air disaster a few years later. He had been offered a trial by Preston after being spotted by a scout when playing in the NSW State League for Leichhardt-Annandale. Marston spent five seasons with North End - he was later named fourth in the list of their 100 greatest players - and, despite being offered a lucrative contract with Arsenal, decided to return to his home town of Sydney in 1955, where he again linked up with Leichhardt. He became player-coach of Australia in 1958 and ended up playing 37 times for the Socceroos. He faced Stanley Matthews, then playing for Blackpool, during a tour by the English club in 1958. 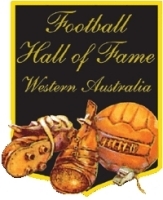 He was immortalised when the best player award, the Joe Marston Medal, was named after him for initially the NSL Grand Final and later the A-League Grand Final. The first winner of the Marston Medal was Abbas Saad of Sydney Olympic in the 1989-90 season. Two Perth Glory players have won the award - Simon Colosimo in the 2002-03 final against Sydney Olympic and Jacob Burns in the 2012 decider against Brisbane Roar. He was awarded an MBE in 1980 and an Australian Sports Medal in 2000 for his services to sport. Football Federation Australia CEO David Gallop expressed condolences to the Marston family on behalf of the football community. 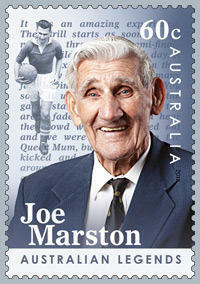 "Joe Marston was a giant of the game, in his stature as a player and his towering achievements," Gallop said. "He was a pioneer in the 1950's, showing that Australian footballers were capable of matching it with the best in the English First Division. This was a remarkable achievement in itself. 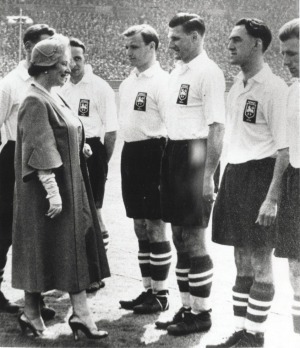 PIC ONE: Joe Marston (third from right) is presented to the Queen Mother at the 1954 FA Cup final. PIC TWO: Joe and the famous 2012 postage stamp.